May’s recent comments did not leave any impact on GBP and now GBPUSD is chiefly under the influence of Manufacturing Production and Industrial Production releases. 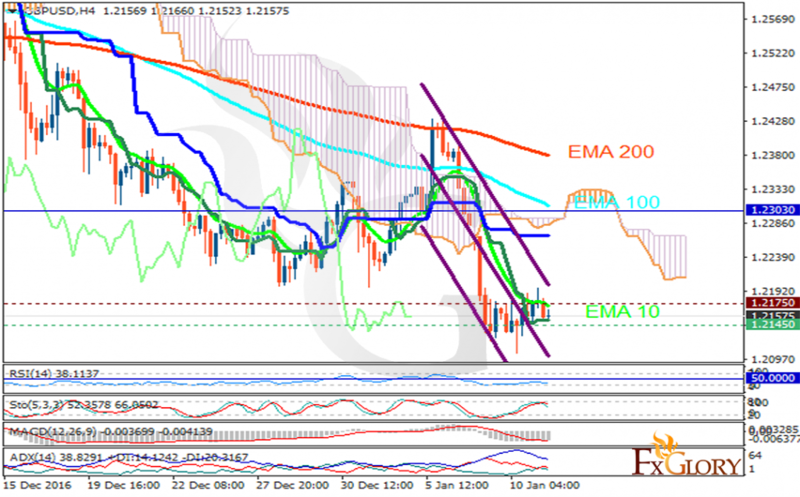 The support rests at 1.21450 with resistance at 1.21750 which both lines are below the weekly pivot point at 1.23030. The EMA of 10 is falling down along the descendant channel and it is below the EMA of 100 and the EMA of 200. The RSI is moving below the 50 level, the Stochastic is moving in high ranges, showing downward momentum and the MACD indicator is in negative territory. The ADX is showing a weak sell signal. The price is below the Ichimoku Cloud and the Chinkou Span. The Tenkan-sen and the Kijun-sen are both showing horizontal trend. Short positions are recommended targeting 1.2100.